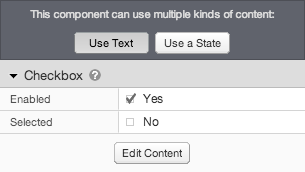 Create a checkbox, which you can use as part of a form. You configure the component by specifying label text, whether the component is checked by default, and whether it is enabled. The label text is always displayed to the right of the checkbox. If you want the label to be in a different position, or to have rich formatting, clear the text and use a separate component for the label. Enabled Whether the checkbox is enabled. A disabled checkbox is not clickable in the design. Selected Whether the checkbox is selected (checked) by default.